In Linda Fairstein’s outstanding new novel, the New York Public Library houses dazzling treasures—and deadly secrets. When Assistant District Attorney Alex Cooper is summoned to Tina Barr’s apartment on Manhattan’s Upper East Side, she finds a neighbor convinced that the young woman was assaulted. But the terrified victim, a conservator of rare books and maps, refuses to cooperate with investigators. Then another woman is found murdered in that same apartment with an extremely valuable book, believed to have been stolen. As Alex pursues the murderer, she is drawn into the strange and privileged world of the Hunt family, major benefactors of the New York Public Library and passionate rare book collectors. Eventually Alex connects their internal family rivalries to a priceless edition of Alice in Wonderland, which also contains the world’s oldest map. Would one of the well-bred Hunts be willing to kill for the treasures? The search for the answer takes Alex and her team on a breathtaking chase from Manhattan’s grandest apartments to the secret tunnels and chambers of the New York Public Library, and finally to a nineteenth-century underground vault. There, in the pitch-black darkness, Alex comes face-to-face with the killer who values money more than life. 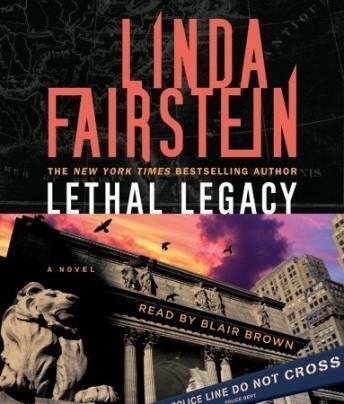 Featuring a cast of elite, erudite, and downright eccentric characters, and a complex trail of clues that will have you guessing until the final pages, Lethal Legacy is Linda Fairstein’s most beguiling thriller yet.